Mary Spitzack, 90, died on May 12, 2018 at Brookdale Senior Living. Memorial service will be 11 AM, Tuesday May, 22 at the Brick-Meger Funeral Home. Friends may greet the family from 9:30AM to 11:00AM before the memorial service at the funeral home. Mary was born to Salem and Charlotte Coderre on January 27, 1928 in Tracy, MN. 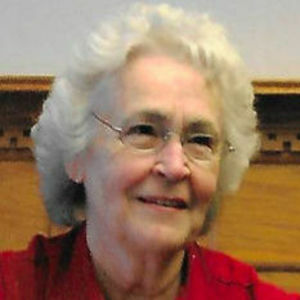 She graduated from Owatonna High School in 1945. After high school, she worked as a teller at Farmers National Bank. She was united in marriage to Les Spitzack on January 29, 1948 in Owatonna. Mary was a homemaker and worked alongside her husband in his business. She enjoyed drawing, writing, painting, golf, and public speaking. Mary was very involved with Owatonna Christian Women and was a charter member of Little Theater of Owatonna. Mary will be remembered as a lifelong learner and for her devotion to Jesus Christ. Survivors include her three daughters, Leslie (Gary) Seykora of Wabasha, MN; Kathy Pegg & Mary Jo (Mike) Haley all of Owatonna; four sons, Chuck (Chris Vice) of St. Paul; Jack (Diane) of Owatonna; Ron (Linnea) of Austin, TX; Brad (Carrie) of Owatonna; twenty-four grandchildren; thirty great-grandchildren. Mary was preceded in death by her husband, one grandchild, son in-law, one brother and one sister. Memorials are preferred to YWAM Tyler and Salvation Army.